My first year as a Scout was the 40th Anniversary of Camp and while the patch collecting bug took a few more years to kick in, it was not long after that I acquired this 40th Anniversary Jacket Patch. 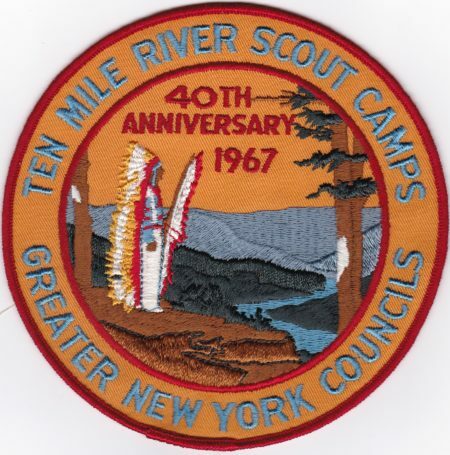 What patch was issued for your first year attending summer camp? My first year was 1987…not sure there’s space to list them all! Just found this site. I have a bunch of 1960’s vintage TMR, OA, Kaufmann, Alpine, Pouch, and Schiff patches, World Jamboree patches (embroidered and leather), neckerchiefs, vintage slides, etc. that I would like to see go to a good home or homes. If you are interested, please contact me. FYI, back in the day, I was at Camp Hayden with Troop 56 from Forest Hills, NY. By the way, I have the 40th Anniversary patch listed above.